Now you can save time by always having two spools ready to sew, quilt or embroider. This 2-spool thread stand provides enough room for most spool sizes and large cones, too. Help save time and hassle with the 2-spool thread stand accessory. It provides the versatility you need and helps to ensure consistent thread delivery. This thread stand allows for up to two King thread spools and features a telescoping thread tower for easy height adjustment. Brother SA563 Thread Stand 2 Spool can hold up to two King Thread Spools of cross-wound thread and helps to ensure consistent thread delivery. Included with the Brother SA563 Thread Stand 2 Spool are several different sizes of plastic thread cones and caps to accommodate varying spool sizes and offer better control. The vertical arm of the Brother SA563 Thread Stand 2 Spool lifts the thread higher than the machine, which facilitates an even feed without added tension. Enjoy added versatility with the telescoping thread tower, which allows you to easily adjust its height to accommodate larger projects. You can't beat AllBrands pricing and super fast shipping. 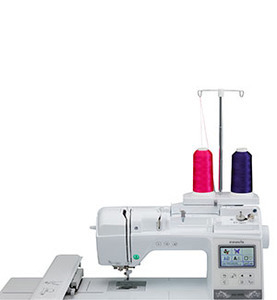 When my dealer said there was no thread stand for my NQ1600E, I immediately checked on AllBrands site and was delighted to find exactly what I wanted. THANK YOU!